Forget most of what you know about Jane Austen and her biggest classic, Pride and Prejudice. Then, and only then will you be ready to experience the madcap new rendition served up on a sumptuous platter by KC Rep.
A lively new stage version of “Pride and Prejudice” comes from playwright Kate Hamill, and with direction by departing KC Rep director, Marissa Wolf, the laughs begin within the first 10 seconds of the play and never end. 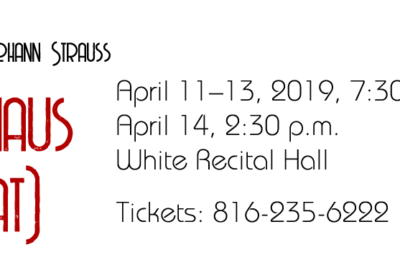 Wolf and choreographer Darrell Moultrie conspired to create the must stunning, shocking, funny opening ever for an Austin play. Guaranteed, the opening sequence surprises, shocks, delights, the audience, setting the tone for satirical comedy about English culture of the early 1800s. 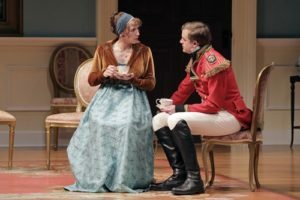 Austen’s book serves as the background for the story, but the new rendition presented by KC Rep pushes and breaks all boundaries in creating a physically funny comedy that remains sharp, cutting, and true to Austen’s classic. 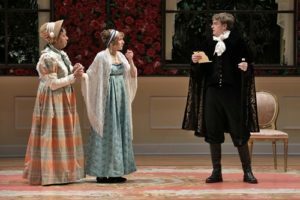 “Pride and Prejudice” guarantees the audience will climb aboard for a joy ride through the struggles of Mr. and Mrs. Bennet as they worry and fret about their daughters’ futures and the inheritance of the family estate. By English tradition, property flows to the eldest male relative upon death of the family patriarch. (It’s like the English crown always went to male heir–until the recent change.) As such, Mr. and Mrs. Bennet seek a wealthy husband for one of their four daughters. 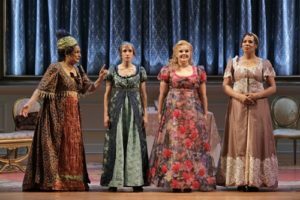 (Yes, Austen fans, there were five daughters in the novel.) In this version, Mary, Jane, Elizabeth, and Lydia. 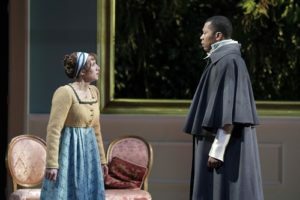 Hamill’s version allows for slapstick humor throughout the play, and Wolf’s staging has the audience engaged watching the action move throughout the two-act play. So much movement, comedy, and action continue throughout. At times one does not know where to focus for fear of missing something else. Of note are Kimie Nishikawa for beautiful sets and Melissa Torchia for costumes. Also on the team are Masha Tsimring, lighting design; Madeline Oldham, scenic design; Yu-Hsuan Chen, associate scenic design; Mary R. Honour, production stage manager; Scott Stackhouse, voice and dialect coach; John Wilson, fight choreographer; Amy O’Connor assistant director; Allison Hanks, wig design; Rachel M. Dyer, assistant stage manager. 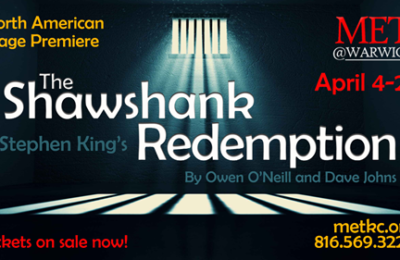 As for the cast, Wolf could not have created a better troupe for this play. The local actors created characters not seen before by them. How great to see them present something fresh, new, and broadly comedic. Every one of them gave their characters a special flair. Spectacular job by all of them. They should be super proud of their work. They are: Walter Coppage as Charlotte, Mr. Bennet, ensemble member; Sam Cordes as Mr. Collins, Wickham, Miss Bingley, and ensemble member; Nedra Dixon as Mrs. Bennet and ensemble member; Bree Elrod as Lizzy; Nicole Marie Green as Lydia, Lady Catherine, and ensemble member; Andy Perkins as Bingley, Mary, ensemble member. 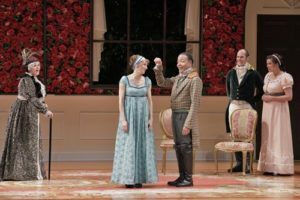 Walter Coppage does a smug job as the poor Mr. Bennet who desperately needs to find appropriate suitors for his daughters to save his estate from going to his cousin. 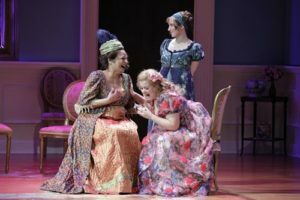 Nedra Dixon shows a frantic, money-hungry Mrs. Bennet who aggressively seeks matrimony for her daughters (well, all but Mary). She’s delightful in this really comic portrayal. 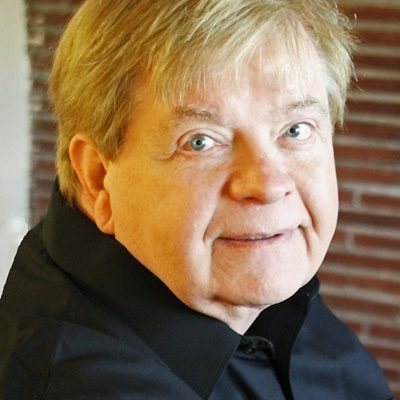 Sam Cordes portrays three super-different characters with his own dash of comedy. He’s sharp and funny with all of them. Bree Elrod usually gets cast in darker parts, so Lizzy is a refreshing change for her and gives her the chance to present a lighter character. As the youngest daughter, Lydia, Nicole Marie Green develops a fun character so different from the many dramatic roles she played in the past. Her flair for comedy shows. She gets to play two very different characters and draw on her comedy background. Andy Perkins gets to let his lighter side take hold as he portrays the unattractive sister Mary as well as the ever obedient Bingley. Some scenes with Green definitely draw the audience attention as does his retriever stint with a ball. Be prepared to laugh and enjoy. 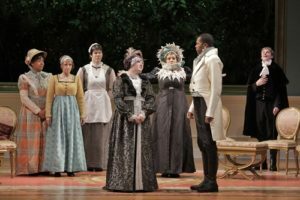 Two out-of-town guest actors for this production are Brian Demar Jones as Darcy and Lauren Spencer as Jane, Miss DeBourgh, and ensemble member. Wolf could not have selected better performers to join the local cast. Each gave a funny, convincing performance, and they both seemed to work so well with the local actors. It is hoped they will return for subsequent KC Rep shows. As Jane, Spencer is the voice of Jane Austen as she stands apart from the other characters in the story. Her quick decisions lead to later conflicts and tie the plot devices together so well, as probably intended by Jane Austen. Her other characters allow her to have a stark contrast to the lead character of Jane. And, no version of “Pride and Prejudice” would be complete without a strong, masculine presence of Mr. Darcy. In this version New York actor, Brian Demar Jones brings that character to stage with an ease and stage presence that draws the audience to him. Overall, the chemistry of the cast adds spark to the show. From the opening segment, the energy flows to the audience. The audience responds to the onstge energy with more energy. 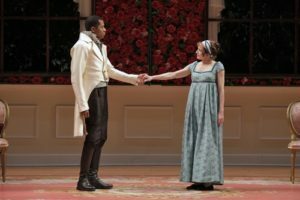 From the very first seconds, the audience senses that this show is a new “Pride and Prejudice,” and it’s amazing. Be sure to see this show if you can. Marissa Wolf and her talent will be missed as she departs for Portland, Oregon as an artistic director in that community. Wolf said she hopes to create shows that can be co-produced in several cities, similar to “Indecent” which traveled to three cities. Wolf directed “Pride and Prejudice” and “A Christmas Carol” this season for KC Rep.
“Pride and Prejudice” runs through April 20. A special sensory awareness performance is scheduled for April 20 at 2 p.m. This performance is slightly altered for special needs persons. The show remains the same, but sounds are sometimes softer, lighting sometimes toned down a bit. To the general public, the show will look and feel the same. For special needs audience members extra care is added for their enjoyment.